Sometimes life gives you opportunities that you need to seize at once. 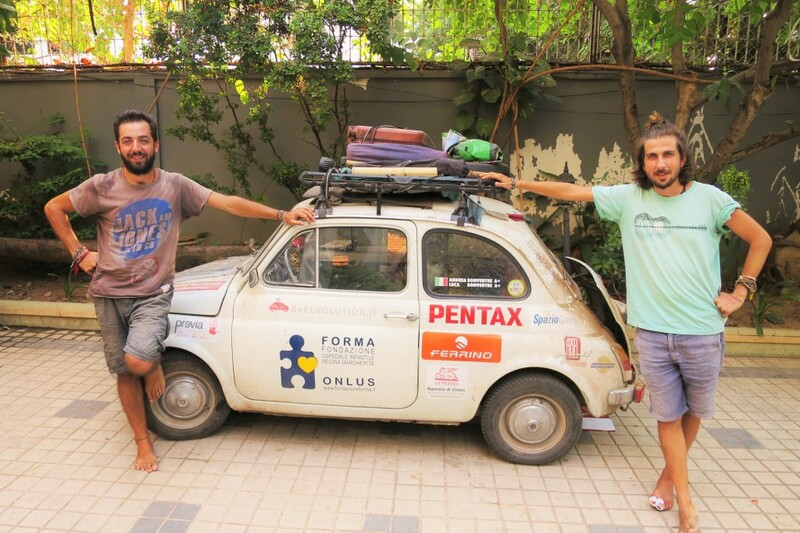 Recent guests of Envoy Hostel Phnom Penh, Luca and his cousin Andrea’ originally from Italy found themselves on a dream journey of a life time when they only set out to buy a car! Luca has a deep passion for motorbikes and an insatiable desire to discover the world. He bought a car from Sardinia, an island in Italy. The shipment of the car to Turin, where the two cousins live, was too expensive. Thus Luca suggested to collect the car from Sardinia themselves. They picked up the car and spent a beautiful week in Sardinia. They camped, appreciated the beautiful scenery and enjoyed the wonderful weather without a tourist insight! After this short trip, when they were already close to Andrea’s place, both of them thought it would be a shame to go straight back home. Why not to head to Bangkok? They had caught the travel bug! And hence their adventure began. Andrea, a professional photographer, was inspired to this profession through his travels. The pair, already 10 months on the road, have explored 13 countries including: Italy, Slovenia, Croatia, Bosnia, Serbia, Bulgaria, Turkey, Iran, Emirates, India, Myanmar, Thailand and are now in Cambodia. Andrea says he ‘takes photographs of the world to better understand it, to understand himself’. He personally has traveled to around 30 countries. ‘Travel is our common passion, but we also made it a little bit challenging. We knew about a hospital in Turin’ Regina Margherita. It is home to many children with cancer. We wanted to dedicate our travels to children. Any country we go, we visit hospitals, orphanages, places where kids are around. We ask the children to paint their dreams. Later we collect the paintings. As we want to show through children’s dreams what our future is going to be like. We all know that children are the ones who create our future. Yes, we live in different places. We have borders. But we are all the same’, Andrea adds. Now, the two cousins are traveling around the world. They collect children’s’ dreams and fund raise for children’s programs. Meanwhile, they enjoy discovering new places and meeting people. 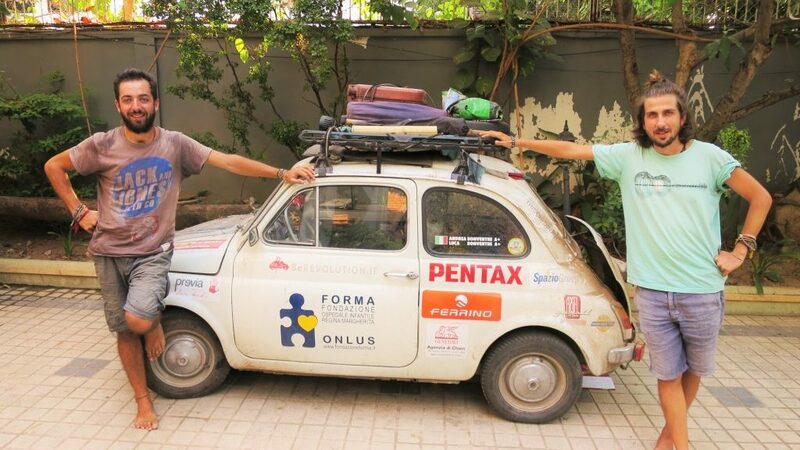 They intend to reach Japan as their final destination traveling in a 1965 Fiat. The pair proudly mentions that this car used to be ‘everyone’s car’ in Italy, and they want to show that everyone can do the same now. Everyone can travel around the world even in a small car. What you need is passion and eagerness to start. Small Car - Big Impact!